Halloween is almost upon us and we haven't featured any horrorods yet this season...WHAT HAS HAPPENED TO THIS WEBSITE? Gotta fix that...and you are gonna help. 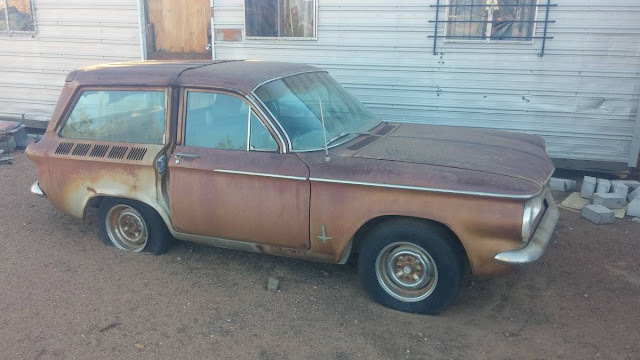 Start out with this 1965 Chevrolet Corvair Custom 2-Door wagon offered for $675 near Santa Clarita, CA via craigslist. I'm not going to comment on the aesthetic implications of the proportions that were achieved with this rear seat chop...but I am gonna point out the rusty welded connection that looks ready to break apart at the first speed bump. We've got a real winner here. You're not going to point out that the front door doesn't match up with the rear door jamb? Good luck getting the doors to latch. What....that's just a gallon of bondo away from being a perfect fit! My gosh, that Corvair is an absolute bargain. Imagine if you had that much patina on any other rear-engined, air-cooled flat 6 car (you know who you are, Porsche). It would be $50K all day long. For $675 it's actually a pretty cheap parts car if you need some sheet metal pieces, trim, or glass. Being in SoCal, it's likely light on rust content. Definitely not something you'd want to drive as-is unless you have a deathwish. It'd be a neat car to finish. Need to section doors to piece on the rear part of the rear doors, and get glass cut to fit. And get things lining up with that roof. Probably look pretty good if finished properly! Can't afford a p1800? maybe chop the roof a few inches and you're gold. Seller neglected to add the phrase 'shooting break'. Surely that could have pushed the price way above $680? Plus with the gear in the rear, as in engine, you should be able to keep your game (pheasants, grouse, hedgehogs) warm by simply removing the engine cover. Though that may affect the driving dynamics/enjoyment experience of this unique and affordable gentlemen's motor coach. Wire spokes, white walls will, burled walnut, houndstooth, and Connolly leather are all that separates this fine marchine from residing within the forecourt of any English castle or manor. "Huntingworth my good man, fetch my cravat, slippers, and white coat, the one with multiple buckles and straps. I feel a chill coming on"
I think the Corvair engine is still there, not a completely sliced and welded on VW rear clip. That means just the body was changed to be a wagon. Maybe its not that scary... Who am I kidding. This mess scares the crap outta me.